When I brought Fritz home from the hospital, we arrived to a very happy William. His grandma and grandpa Bryant had been staying at our house and he loves to play with them! It made for an easier transition to know that he had been well taken care of while I was devouring all the deliciousness of that private time with my newborn in the hospital. My mother-in-law had scrubbed my floors, filled the refrigerator with food and put a pretty vase of daffodils at my bedside. I was so grateful and she also had brought new toys and books for William as well as the best movies to watch: The Beatrix Potter DVD Collection. These aren't "new" but I find that most people haven't heard of these movies so I wanted to share. I freely admit that I am a total sucker for anything old-fashioned, British or produced by the BBC but you guys, these movies are so wonderful. They have such cute little voices (no obnoxious adults talking in baby voices here! ), classic stories that are true to Beatrix Potter and have beautiful illustrations. 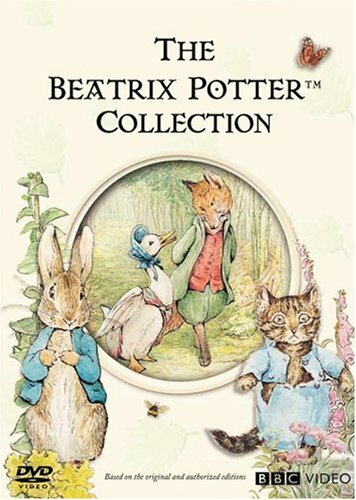 I love the whole Beatrix Potter collection. The stories are clever and funny and I was so excited to buy a few of the sweet, little books when we were in London a few weeks ago. I feel like these movies really compliment the original stories, which is pretty rare I think. I love the beginning of each episode where an actress plays the part of Beatrix Potter in her little cottage at Hill Top Farm and the music is so enchanting. I love listening to this in the background. Here's a little video of William's favorite episode - The Tale of Pigling Bland. I just love it. If you're a fan of more classic shows for children then this one's for you. William loves it! It's one of his very favorite things to watch and Fritz is starting to really enjoy them too. Here's a little tip - it's cheaper to buy these separately than buy the whole 3-disc collection. Thank you for sharing! I did not know about these and would love to get these for my littles. I have a fetish for anything European too! My 3 year old daughters favorite thing to watch are the Madeline episodes. So so cute! Have you introduced your boys to Pocoyo? My daughter also loves the simplistic cartoon that is narrated by Stephen Fry. I love anything European too! They just seem more sweet and innocent. My daughter is in love with Madeline and their little cartoons are so so cute! Lots of singing. Have you introduced your boys to Pocoyo? It is narrated by Stephen Fry. Very simple cartoon that my daughter also enjoys. I own a few but you can find episodes on YouTube as well. That is just too cute! Old fashioned cartoons are SO much better!!! I hate hate hate modern cartoons. Amazon? I love Beatrix Potter too!